"There’s a giant bull in the [Turkey stock market] china shop," exclaims one trader, but (unsually for Turkey), "nobody knows anything for sure" about who he, she, or it is. As Bloomberg reports, a mystery investor who first appeared a year and a half ago with $450 million of bets on a single day, almost double the market average, is now executing major transactions with increasing frequency, scaring away competitors who can’t figure out when he or she will strike next, traders and bankers said. At least one European bank’s clients have stopped taking short-term positions in Turkish stocks after concluding the investor is using an algorithmic system in which complex formulas decide trades, while others are avoiding the market until they have more information, a person familiar with the matter said. “Herif,” or “the dude,” has helped lift the average daily trading volume on the Borsa Istanbul almost 8 percent this year, compared with a 15 percent decline on the main exchange in Warsaw and a 27 percent plunge in Moscow, data compiled by Bloomberg show. While little was known about the source of these buying sprees, whoever it was had skipped from one local brokerage to the next honing his system and had turned the latest, Yatirim Finansman, into the biggest net buyer on the market by far. As a result, Yatirim Finansman became well known to Istanbul traders: starting in 2016, it became the talk of the town for its aggressive trades which singlehandedly steered the direction of the stock market, including moves right before last year’s referendum. Traders started referring to the mystery investor or investors, whose identity has never been revealed, as "the Dude." Nearly two and a half years later, "The Dude" is back with a vengeance because as Bloomberg reports this morning, a single brokerage in Istanbul - the same one that the mystery trader used during his 2016 rampage - "has been placing outsize bets on Turkish stocks at a time when less adventurous investors are bracing for a crisis." 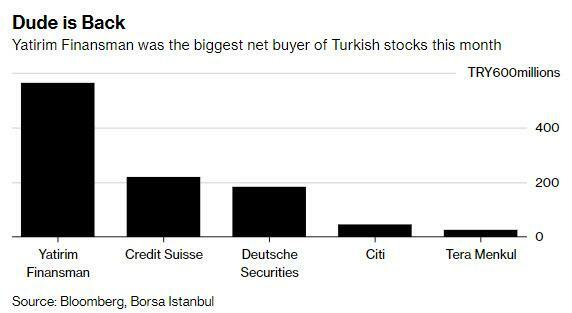 Yatirim Finansman was a net buyer of 565 million liras ($105 million) in equities this week, by far the largest bet on the market in either direction and almost tripling the second-most active buyer, according to data compiled by Bloomberg. That’s helped to make the equity gauge a major outlier, up by 3 percent even as the lira plunged by about 6 percent to record lows and bond yields surged to all-time highs. The mystery algo has returned at a time of economic in Turkey turmoil amid collapsing diplomatic relations between Ankara and Washington over the imprisoned American past Andrew Brunson who has been jailed in Turkey for two years, and whose continued house arrest resulted in sanctions being announced last week against Ankara by the Trump administration. And while the threat of successively more damaging economic sanctions should Turkey continue to hold him, coupled with soaring inflation as a result of Erdogan's prohibition for the central bank to raise interest rates, has sent almost every asset class in Turkey tumbling... except stocks. The surprising resilience of the Borsa Istanbul in the context of the crashing Turkish lira and record high interest rates is shown below. Borsa Istanbul moved its servers to a new data center [in 2015] in the hope of attracting business from automated traders before it restarts its long-delayed initial public offering. HFT firms often place their servers in the same center to get the fastest possible connection to an exchange’s computers. Okte said he’s convinced the unknown investor is doing just that. But whoever is behind the HFT algo, they have a clear mandate: keep the market propped up. The bulk of the Dude’s trades this week was directed at the nation’s biggest private bank. It bought a net 96 million liras worth of shares in Turkiye Garanti Bankasi AS. That was followed by investments in petrochemicals producer Petkim, steelmaker Kardemir, defense equipment producer Aselsan and another steelmaker, Erdemir. Its biggest net sales were in Halkbank, a state-run lender facing the prospect of a fine from the U.S., and media conglomerate Dogan Holding. Another notable divergence: the positive impact of the "Dude" on the local stock market matches that of central banks, and despite being vastly outnumbered, his dominance remains: of 48 Turkish brokerages tracked by Bloomberg, 31 have been net sellers this week. The biggest net sales came via Is Yatirim, Yapi Kredi and Merrill Lynch. Following Yatirim Finansman on the buying side were Credit Suisse Istanbul and Deutsche Securities. The Turkish stock exchange has welcomed the larger trades via Yatirim Finansman and its mystery investors. 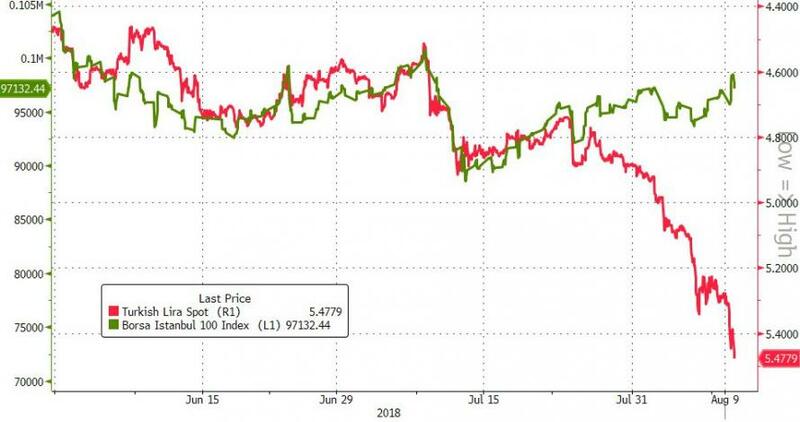 Still, every artificial manipulation can only last so long, and in the case of Turkish stocks, it is only a matter of time before Turkey's economic collapse overpowers even this remarkable algo. After a 40% plunge this year, Turkish stocks are trading near a nine-year low in dollar terms. 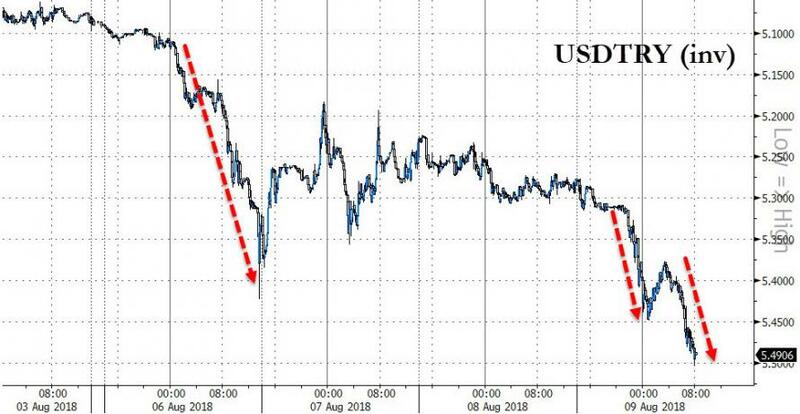 But the real risk for Turkey is not whether or not the "Dude" continues soaking up all the selling, but whether that "Other Dude", executive president Erdogan, remains in charge of the economy, the central bank and ultimately, the market, which has just sent the Turkish lira to a new all time low, plunging more than 30% YTD.